Your GoPro is great in the cockpit, but to capture the entire story, you need the audio from your headset, intercom, and radio. This cable makes that possible while also allowing you to power your GoPro indefinitely. 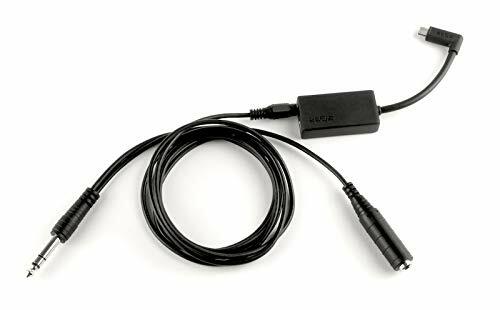 Use this cable to connect your GoPro Hero7 Black, Hero6 Black, Hero5 Black, or Hero5 Session to your intercom. Plug one end into the side of the GoPro and the other into a standard PJ jack. The GoPro will record everything you hear and say through the headset, including intercom and ATC communications. Record indefinitely by plugging a USB battery pack into the power input. (Please note: Due to the design of the GoPro, using aircraft power will not work.) This cable is very easy to use. The door on the side of the GoPro is removable, allowing you to plug the cable into the camera. The cable includes a female plug to plug your headset into, so you're not blocking an intercom jack. COMPATIBLE WITH: GoPro Hero7 Black, Hero6 Black, Hero5 Black, and Hero5 Session. Not compatible with any other GoPro. Records all headset audio, including intercom and ATC. Includes a noise-reduction circuit for crystal-clear audio. Works with standard twin plug headsets. Also works with aircraft with built-in ANR headset (single-plug LEMO) by plugging into auxiliary standard ports next to the LEMO plug. The CX-3 Flight Computer makes flight planning simple by taking confusion out of the equation. Fast, versatile and easy to use, the CX-3 delivers accurate results quickly and efficiently. 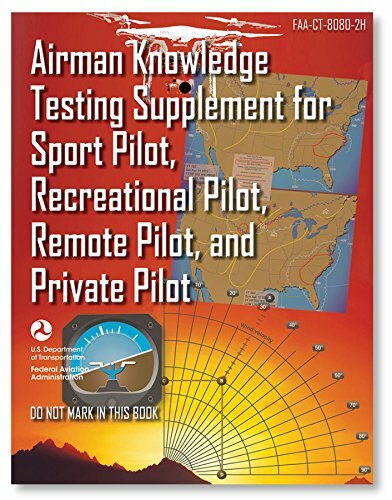 It can be used on all FAA and Canadian pilot, mechanic, and dispatcher knowledge exams. Whether used for flight planning, ground school, or knowlledge testing, the menu organization reflects the order in which a flight is normally planned and executed, resulting in a natural flow from one function to the next with a minimum of keystrokes.Multiple aviation functions can be performed on the CX-3 flight computer including those related to time, speed, distance, heading, wind, fuel, altitude, cloud base, standard atmosphere, glide, climb & descent, weight & balance, as well as a holding pattern function to help determine entry method and holding details. A calculator, clock, timer and stopwatch are also built in along with mutliple settings for lighting, backlighting, themes, scrolling speed, time zones and more.The sleek design, and ergonomic fit and finish of the CX-3 make for easy transport. The protective cover comes off the front and snaps onto the back of the computer. A no-slip-strip prevents the CX-3 from sliding around on smooth desk surfaces. A Theme feature provides a convenient way to switch from Standard view to Night or Daylight views. The backlighting feature controls the brightness or intensity of the screen, and the buttons on the keypad will light up in Dusk and Night modes for use in darker environments. 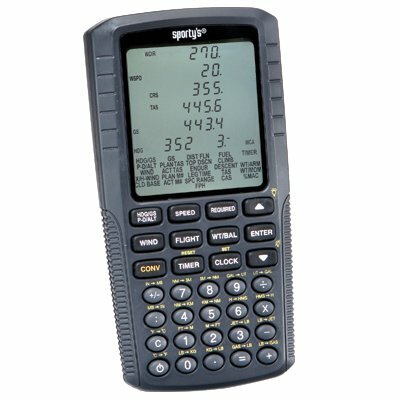 A Favorite feature provides quick access to your most frequently used function and store the Aircraft Profile will let you store numbers specific to your aircraft.Package includes CX-3 Flight Computer, 4 AAA batteries, protective cover, and quick start guide. 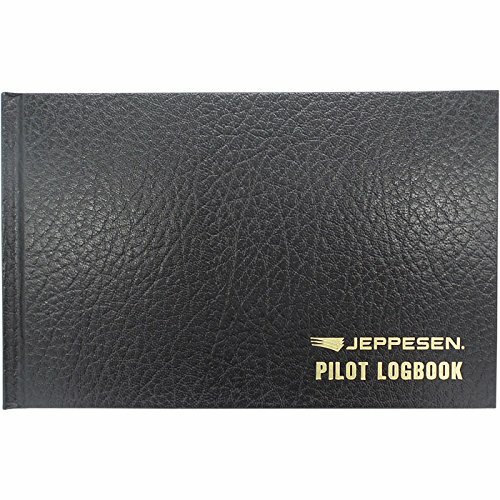 With superb craftsmanship, pages that hold up to 10 years of data, it's no wonder why this logbook has become a tried-and-true favorite of aviation professionals. 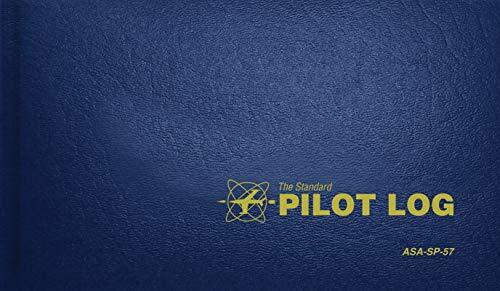 Its design matches that of the Airway Manual binders, and it includes simplified pilot and aircraft annual summaries. This tried-and-true favorite of aviation professionals can hold up to 10 years of data. Measures 6 3/4" x 11 1/4". Brand: Jeppesen | Manufacturer: Jeppesen Sanderson, Inc. The best slide-rule-style flight computer on the market, now enhanced with color for even easier readability. On the circular side, black is used for the rate arrow and units to be calculated; Red is used for weight and volume; Blue is used for distance, time and temperature scales. On the wind side, colors are used to identify wind variation: blue identifies west (or right wind correction angle) and red identifies east (or left wind correction angle). ASA's color E6-B is made with solid aluminum construction and features all the functionality pilots have relied on for decades. A venerable favorite, now even better! Vinyl case and instruction booklet included. Measures 9-3/4" x 5". 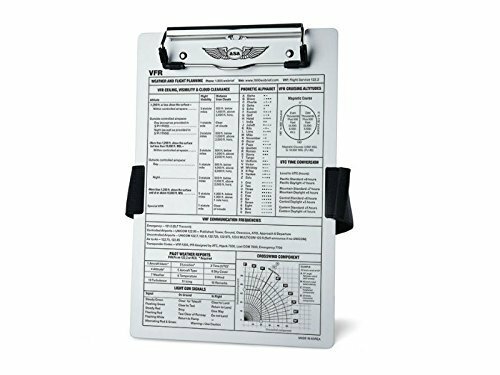 This durable brushed aluminum kneeboard is a great way to organize your flight data, providing a strong surface for inflight note taking as well as quick access to important VFR information in the form of a permanent placard. Features include: Comfortable, 1-1/2" wide elastic legband that hugs the leg without binding hook-and-loop fasteners adjust without removing kneeboard Pencil/pen holder within legband for fast note-taking. 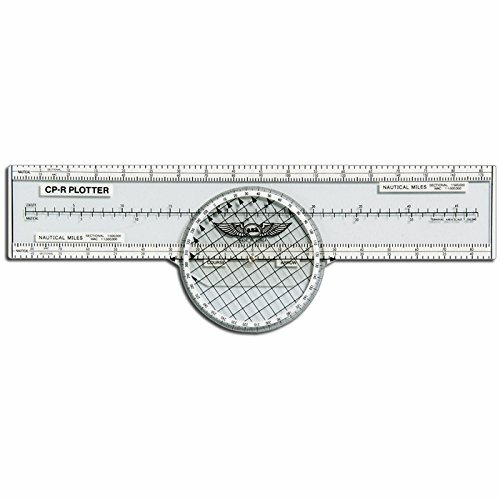 The 4-3/4" wide metal clip is easy to lift and strong enough to hold charts and other necessary papers. The 4-3/4 wide metal clip is easy to lift and strong enough to hold charts and other necessary papers. Constructed of sturdy, clear plastic with easy-to-read numbers and scales. 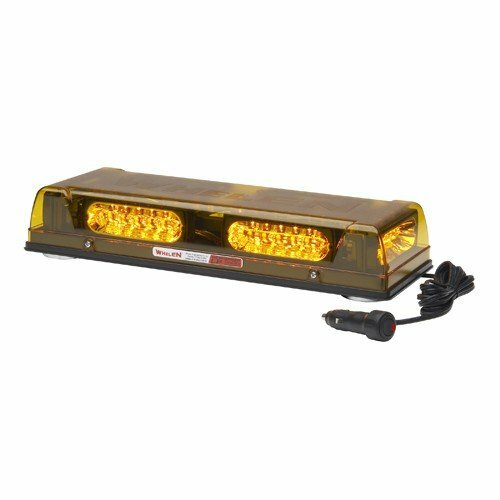 It includes WAC, Sectional, and Terminal Area scales, and is checked and approved by the Weights and Measures Department. Quick scale reference is provided for both statute and nautical miles. 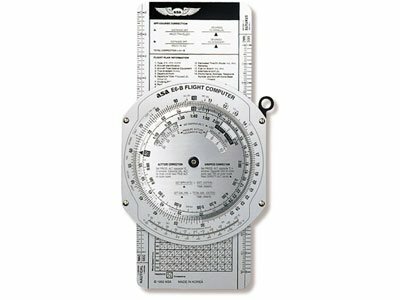 Non-slip rotating azimuth eases flight planning. Made from strong plastic for quick course readout. Rotating azimuth eases flight planning. Introducing our newest Fly Boys product, the Reversible Kneeboard! Designed specifically to accommodate ALL Pilots (right AND left handed! ), while providing the same features as the standard kneeboard you know and love. All pouches and pen pockets are removable and secured in place with hook and loop. You can configure the FB3316 to meet the needs of your mission and preferences. Brand: ASA | Manufacturer: Aviation Supplies & Academics, Inc.
Approved for use on FAA Tests! Over 240,000 pilots have trusted Sporty's Electronic E6Bs over the years for fast flight planning and accurate FAA test calculations. Its pilot-friendly design makes quick work of any navigational, weight and balance, or fuel problem, and it also performs conventional arithmetic calculations. It's invaluable for students and experienced pilots alike. You will never need another aviation computer. 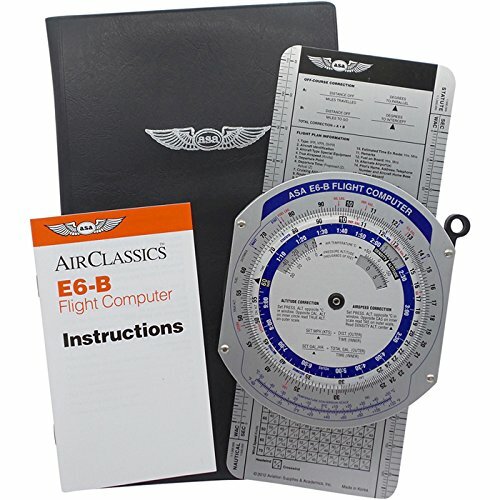 The E6B Circular Flight Computer combines high-quality construction with easy-to-read lettering to deliver the most efficient, accurate, and convenient manual flight computer availalble. Perform multiple calculations ranging from basic arithmetic and flight planning problems to complex in-flight computations. 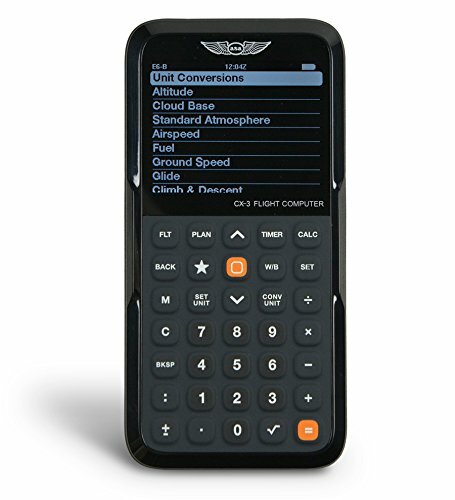 The calculator side of the computer uses conventional slide rule procedures to solve for multiplication, division, and unit conversion and employs scales for performing time, speed, distance, rate, fuel consumption, altitude, airspeed, air temperature, and pressure pattern calculations. The wind side of the computer provides a graphic method of solving problems and displaying the answers in a useful form. Use the wind side for simple addition and subraction problems and also to solve for true wind, winds in flight, true course and ground speed, true heading and true airspeed, and off-course correction calculations. The matte finish on the wind side of the calculator can be marked with a pencil during use, and easly wiped clean to allow input for the next problem. 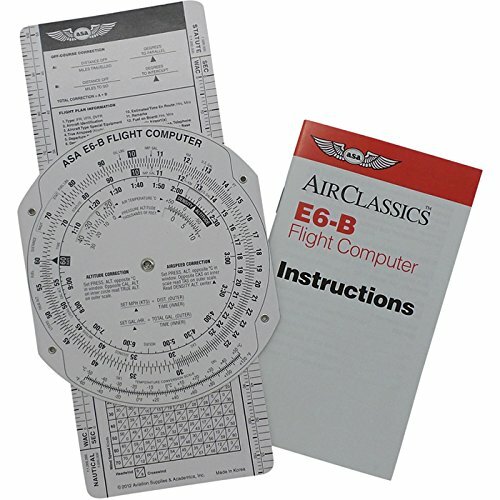 The E6B Circular Flight Computer is a great tool to use during flight planning, flight training or studying, and may be used during FAA written knowledge exams. Pilots flying faster aircraft at higher altitudes will find this computer useful in gaining insight to the external atmospheric conditions and the effects they have on in-flight performance. 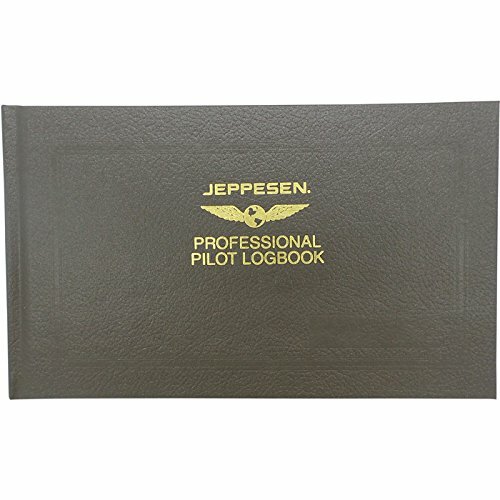 Crafted with durability and a highly-functional design, our Pilot Logbook has become an industry standard - made to go the distance. Large flight-time spaces arranged in accordance with FAA regulations and 520 flight entries ensure plenty of note-taking. And "easy-on-the-eyes" green pages resist ink bleed through. Bound in a scuff-resistant cover. Measures 8" x 5 1/4". Bound in a scuff-resistant cover. Measures 8 x 5 1/4. Made from solid, heavyweight fiberboard, an economical version of the aluminum model described above including all its problemsolving features. New Performance ear seals are designed to hug the curve of the jaw, creating a more natural fit that increases comfort and stability. Engineered for ears Zulu 3's tapered ear seals create a more natural fit while providing 20% more surface area than its leading competitor, for a better seal around glasses frames and a more comfortable distribution of side pressure. Larger cup cavities provides 50% more space for your ears, allowing the entire ear to fit comfortably inside, preventing the pain caused by seals pressing against the edge of the ear. Lightspeed recommends replacement of the soft goods on your headset (ear seals, head pads and mic muffs) every 18 months to ensure peak ANR performance and comfort. Ear seals, head pads and mic muffs are wear and tear items that are not covered by the Lightspeed warranty and are designed to be replaced in the field. To purchase these items, simply add them to your cart and checkout! New Performance Upgrade features wider, softer fit. 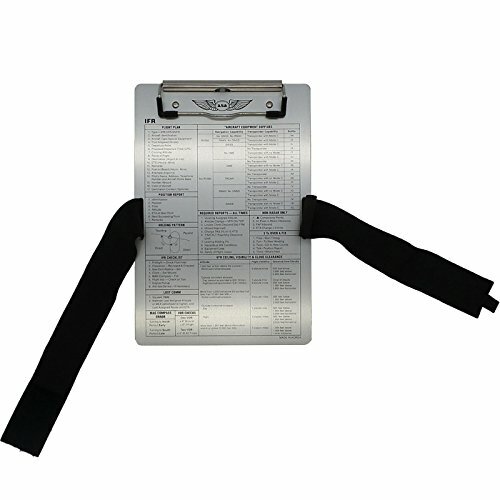 The Flyboys Pilot Kneeboard is the most versatile aviation kneeboard on the market. Designed by an F-16 pilot, this kneeboard is narrower than typical trifolds. It features 7 eyelets for securing checkilists, plastic checklist pages, or even an in-flight guide. Removable plastic clipboard for writing clearances. For the pilot who needs to carry more, this folding kneeboard provides maximum storage space, encourages cockpit organization, and serves as the pilot's desk during flight. The left panel has ample room for small books, papers and items that don't fit elsewhere. The center panel holds the kneeboard under clear plastic with a pen/pencil holder and buttonholes on either side allowing a pilot to fold back one or both panels with the legband. 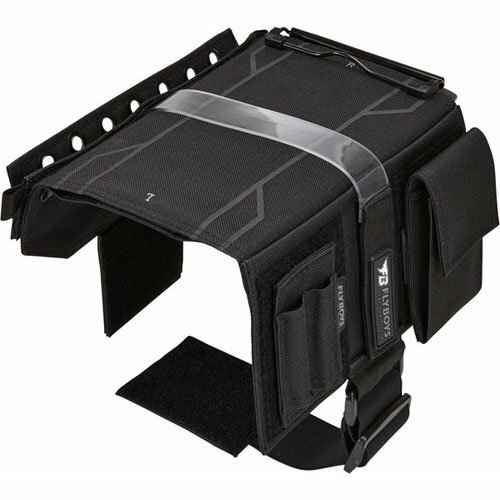 The right-hand panel contains a clear pocket for easy map viewing, and the elastic legband's Velcro closures fit any leg size comfortably. 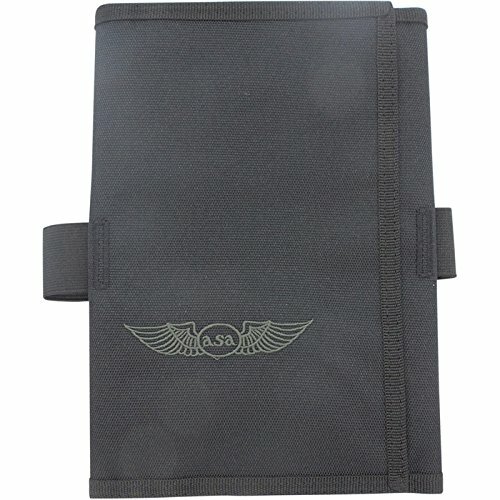 Black nylon with embroidered silver wings logo. Kneeboard is 6-1/2 wide x 9-1/2 high. This is the same book issued during the FAA Knowledge Exams at the computer testing centers. These "figures books" are exactly as released by the FAA, with all charts reproduced in full color. Finally a great compact all in one multi use bag. Eat healthy and save money on the road. Aerocoast is introducing the all-new Pro Cooler II. We have worked together with professional flight and cabin crews to design a highly usable product to meet all if not most requirements. Tired of lugging around more bags than you have to? Tired of choosing between healthy food and snacks options or a laptop? Now you can have it all in one compact easy to use bag. The Pro Cooler II has a larger insulated compartment for more food storage. In addition, it's our only cooler bag with a bottom expandable compartment. As always all our coolers come with YKK Zippers, ergonomic snap handle, and quick access sunglass compartment for easy storage and organization. 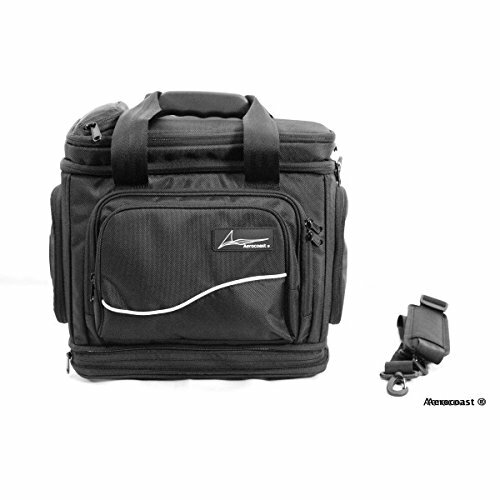 The Pro Cooler II has an attached laptop compartment to carry and protect your laptop, EFB, or iPad. The Pro Cooler II has an attached laptop compartment to carry and protect your laptop, EFB, or iPad. Easy X-ray screening at TSA checkpoints so you will never take out your laptop again. Save time and protect your laptop, iPad or EFB from damage. Main insulated compartment with water resistant material construction. Leak resistant main compartment. Ergonomic interlocking handle for quick, easy, and comfortable use. Quick access sunglass compartment. Upper organizational accessory compartment. Expandable bottom storage compartment. Two front storage compartments with organizer sleeves. Two side storage compartments. Rear laptop, iPad, or EFB compartment. Crew card holder. Shoulder strap attachment. High quality YKK zippers. Four additional pockets for easy storage of accessories. Rigid case construction for added durability. Fits under aircraft seats for easy stowage on travel. Some environments call for a simple way to keep a few charts, maps or checklists at your fingertips. The FB1063 MapStrap is the solution. Constructed of the same high-quality materials as our FB1316 Kneeboard, the MapStrap is built to last in any high-demand, heavy-workload environment. 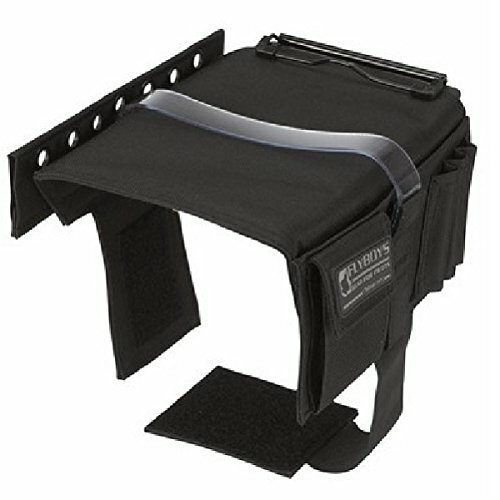 It is adjustable to fit just about anyone and features a see-through strap with a healthy portion of hook-and-loop to keep paperwork secure. The leading and trailing edges of the lower strap feature no-slip PVC material to help keep the strap secure on your leg. 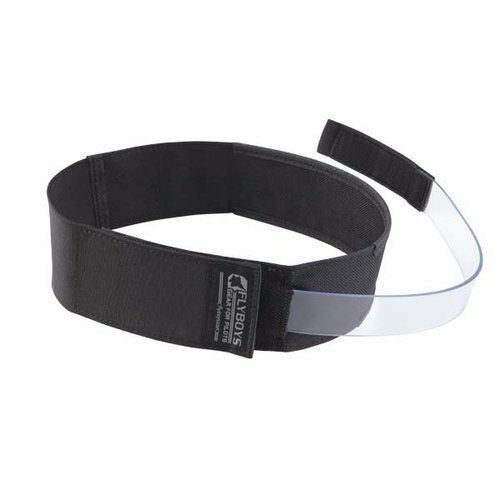 This strap has an adjustable/elastic circumference and measures 2 inches at it's widest point. Some environments call for a simple way to keep a few charts, maps or checklists at your fingertips.